If it would just STOP raining, Snack Girl would get excited about Memorial Day weekend. Click your heels together and repeat after me, "My children will not watch twenty hours of TV over Memorial Day weekend." You see, we love food on a stick! Popsicles, corn dogs, satay are just a few foods that come to mind. How about salad? Salad sticks will help you eat fewer hot dogs, hamburgers, and chips. These babies have just 16 calories each and they taste great. Now, I did not use any oil on these which you may find impossible to do. My grill is non-stick and I got it pretty hot before I put the skewers on it. My suggestion for adding oil is to spray a little olive oil from a spray can. This will add a little flavor and ensure that your veggies are evenly coated without drowning them in calories (thereby reducing their healthiness). 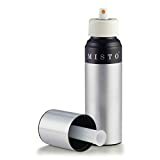 Below, I have featured my new favorite kitchen tool - the Misto. I bought it on Amazon.com because a Snack Girl reader suggested it. This is an olive oil sprayer that you can reuse instead of throw away. You save money and the environment by getting one of these - and you can put your own high quality olive oil in the can (or any other kind of oil that you like). All you do is fill it about half way and "pump it up" and it sprays a fine mist of olive oil. It doesn't use propellants and you will use less olive oil on your salads, etc. How do you make grilling healthy? Wet a paper towel and clean mushroom caps. Remove stems from mushrooms. Cut onion in half and then cut 4 pieces of each half. Clean and cut bell pepper into 1/2 inch pieces. Peel zucchini and slice into 1 inch pieces. 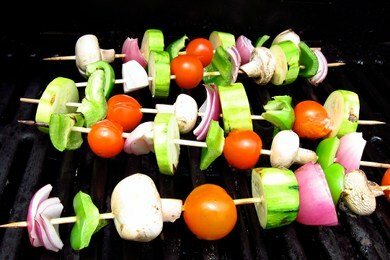 Place ingredients onto skewers. Heat grill and cook on medium heat for 5 minutes per side until vegetables are your desired doneness. Enjoy! These can be made ahead and reheated on the grill or in the oven. This looks easy and yummy! Yum, thanks for the tip! I have a Misto and I love it! 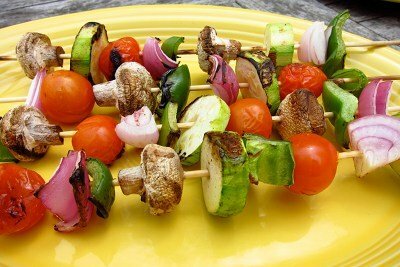 Ya know, you don't even need to grill these - just thread your veggies on a stick and eat them raw - what fun! We love these...but my husband usually insists on some protein so we use chicken or shrimp. Sometimes I make an olive oil/balsamic vinegar with Italian herbs and give each skewer a quick baste before placing on grill. I love my misto!! I usually put the onions alone because I like them to carmelize so they take longer....Olive oil with a squeeze of lemon is what I use and it's delicious...I am with Anne's husband, we do skewers of chicken and shrimp too! We love our shish kabobs!! Have you tried grilled romaine lettuce? I just saw a recipe for it and was going to try it this week end!